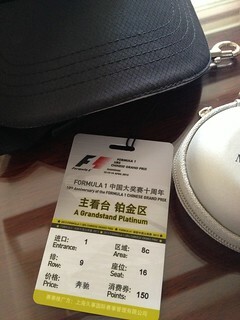 I got a call on Thursday of the Shanghai Formula One race weekend from a friend who told me he scored two Platinum passes courtesy of the good folks at Mercedes Benz. So I booked an air ticket and jiak zhuar on the afternoon the next day to head to the airport. The funny thing was that since this is "jiak zhuar", nobody knows where I was headed. So there I was sitting in the plane on the tarmac as we get ready for departure when my mobile phone rang. It was from the office. My heart skipped a beat and I was struggling whether to take the phone call or not. I relented in the end and "Hello?" All was going great and I thought I was about to get away with it as the conversation was about to end. The PA announcement reminding passengers to keep seat upright, window shades up, eletronic gear off went off! Hong Kan!! Pichar Lobang liao!! Luckily, I think the person at the other end totally did not expect me to be inside a plane and was very likely none the wiser. The plane took off and landed in Shanghai two hours later without incident. I was whisked straight away to go clubbing. The next way was a Saturday i.e. Practice Round 3 at noon then Qualifying Round later in the afternoon. I guess all was made up with another night of clubbing. Now, we come to the actual race day. The place was packed but the weather made everyone comfy as it was a cool breezy 20 degrees. Ahh... the race queens. One thing I can tell you. They all bladdy look alike. They all look like the Chinese clone waitresses in the movie Cloud Atlas! My friend was complaining why wear cheongsam? Cannot see!! Fortunately it was breezier down on the track than in the stands and so the frequent gusts of wind made him happy. Heh. 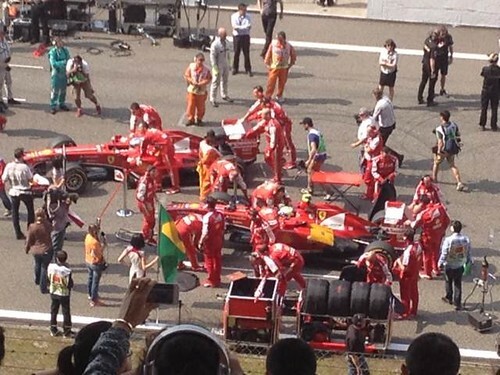 So anyway, it was quite an exciting race and Alonso deserved the victory as he was invincible that day. Vettel couldn't do anything about it and Hamilton just faded as early as the first lap. 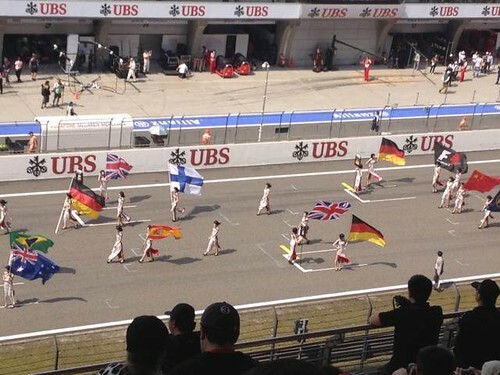 --> Click Here For The Photo Set Of The Shanghai Formula One 2013 Race.